Last week I used the phrase “long weekend”. 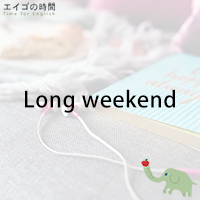 The Cambridge dictionary defines “long weekend” as Saturday and Sunday with at least one extra day added, either Friday or Monday. For example, when we had Coming-of-Age Day two Mondays ago, we had a long weekend. There’s no long weekend in February but one in March. Because Spring Equinox Day falls on Sunday, we’ll have the following Monday off. By the way, we have a new national holiday starting this year. Mountain Day will be celebrated on the eleventh day of August every year. It’s on Thursday this year, so won’t make a long weekend unless you make it so by using your personal paid time off. In 2017, though, it falls on Friday and we’ll have a three-day weekend. But let’s not talk about it now. Because in Japan when you say “next year”, the devil laughs. Now, why don’t you try a quiz? I’ll read three sentences. Please listen carefully and choose the one that is NOT True. Ready? 1. The Spring Equinox occurs in March. 2. There’s no three-day weekend in February. 3. Mountain Day falls on Sunday this year.